Heading off to war trying to be calm. You cry so often - big bloody tears. while he died in your arms. Rest now and don't despair. A war hero hits the ground! Be at peace - your peace is found. Home in the woods of North East Pa. I'm here and . . .You're gone. But prepared to do . . .What you must. Across the sea . . .Leaving me. Left over there . . .With mine. You did your job . . .You gave it all. The small and gentle touch of delicate fingers faintly but irresistibly call me to the Wall. I recall in the year past, which seems so long ago when my mom, wife and son came and called me to this same Wall. Even after all this time, the dewdrops on the Wall still remind me of the tears of happiness that I shed that day. 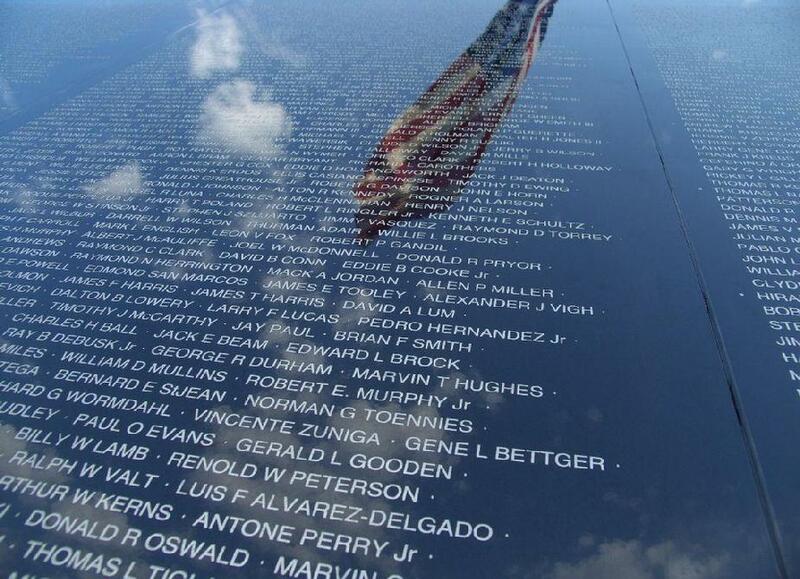 Today, the call is not quite as strong and as I near the Wall, I can see a small child and woman kneeling by the Wall and touching my name that is forever engraved into this cold black granite. As I move slowly and hesitantly towards the Wall, I think that this must be some kind of mistake. I near and hear the child mention something to the effect of �grand-dad� and I instantly think, "Could this be my son's wife with my grand-child?" The feelings of a year's past suddenly return as I look into the face of my grand child and daughter in law. Time has passed, life carries on and the emotions are again awakened that have not yet been forgotten. I long to hold and cherish the delicate body of my grand child. I long to hug and thank my daughter in law for allowing me the time to share in their world. I long to be able to ask questions, share emotions or just for a moment experience a loving touch that does not have to shared by a wall of granite. My destiny denies all of these longings but I am still grateful for these short visits with the �real� world. 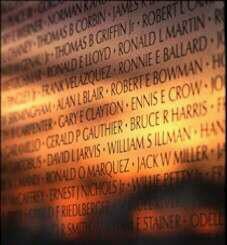 ...I am not forgotten as so many others that stand along with me behind this Wall. These are our grandchildren and they REMEMBER with the help of those that shared and have suffered the effects of Vietnam and our plight to keep the memories alive. The Lord looked down upon His earth. and forgotten for so long! others buried and long gone. a country they'd called home. They'd fought with pride and honor! Why was nothing being done? The Lord saw this and He began to weep. of those whose love flowed deep. as in their lonliness they wept. a man was at The Wall. felt the sorrow in those drops. at his silent vigil spot. but he didn't see the rain. for each who'd suffered pain. containing great and wondrous love. ease tortured hearts and pain. your honor for to keep. and help us set them free? watched many a comrade fall. then we received the blame. Don't you owe us anything? We suffered in your name. you don't even know you're asleep. sang in your voice and strumming hands. in Ohio, watching her grow. and left our baggage in the dark. next Fall would be here soon. and the killing time was coming. and we spoke only of memories. I thought it was my own. sing this Winter coming on. standing frozen in the wind? As I carefully touched the stone. 2d Sqn, 17th Cav, 101st Airborne Division. Republic of Vietnam, 2 June 1969. Born: 2 July 1948, Dayton, Ohio. 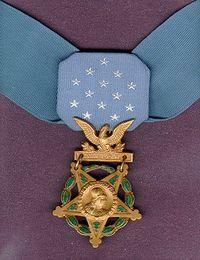 For conspicuous gallantry and intrepidity in action at the risk of his life above and beyond the call of duty. Sp4c. Lapointe, Headquarters and Headquarters Troop, 2d Squadron, distinguished himself while serving as a medical aidman during a combat helicopter assault mission. Sp4c. Lapointe's patrol was advancing from the landing zone through an adjoining valley when it suddenly encountered heavy automatic weapons fire from a large enemy force entrenched in well fortified bunker positions. In the initial hail of fire, 2 soldiers in the formation vanguard were seriously wounded. Hearing a call for aid from 1 of the wounded, Sp4c. Lapointe ran forward through heavy fire to assist his fallen comrades. To reach the wounded men, he was forced to crawl directly in view of an enemy bunker. As members of his unit attempted to provide covering fire, he administered first aid to 1 man, shielding the other with his body. He was hit by a burst of fire from the bunker while attending the wounded soldier. In spite of his painful wounds, Sp4c. 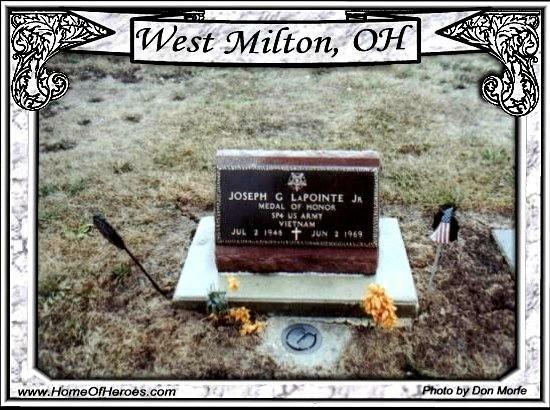 Lapointe continued his lifesaving duties until he was again wounded and knocked to the ground. Making strenuous efforts, he moved back again into a shielding position to continue administering first aid. An exploding enemy grenade mortally wounded all 3 men. Sp4c. Lapointe's courageous actions at the cost of his life were an inspiration to his comrades. His gallantry and selflessness are in the highest traditions of the military service and reflect great credit on him, his unit, and the U.S. Army. I no longer feel the warmth of day on my skin, nor do I feel any pain from my wounds. Though they continue, I cannot hear the sounds of exploding grenades and automatic weapons fire. I no longer smell the pungent aroma from the meal that was prepared only minutes before. It was a short flight to the 12th Evacuation Hospital at Cu Chi. A Marine Corps doctor�Captain Michael A. Wanchick�examines my remains and pronounces my death. He notes the cause as �Missile Wound to Head� and records the time as �1700 hours, 16 October 1970.� I was just getting used to thinking of my former self as �a body,� and now they are referring to it as �the remains.� Hey, there is my sergeant! He is up on his feet, but he does not look very good. John stayed on the ground after I left, and worked with the helicopter gunships. He is physically and mentally exhausted. He feels bad about what happened. He keeps telling himself that he did everything possible to keep his lieutenant alive. He really did do everything possible, but he does not believe it. I want to comfort John and tell him not to worry, but I cannot. The doctors keep him overnight for observation. It is morning now. My remains are moved down the road to the mortuary in Saigon. They arrive at 9:30am. This place is a real production shop, and the workers are very busy, but they are professional and respectful. They fingerprint me and then compare the prints to some I had made back in June, just in case something like this happened. They inspect my teeth and compare them to my dental records by means of a dental chart. My remains are going to be viewable, so I guess they want to make sure it is really me. They also do some repair work on my wounds. The name of the gentleman doing the work is James L. Hobgood. He�s a civilian. James came to Vietnam all the way from Oklahoma to help the American boys on their last trip home. They are also processing a lot of paperwork today. It is morning again...October 18, 1970. James begins a preserving process at 8:00am. By 10:30am, the process is complete and I am ready to go. However, the mortuary personnel have more paperwork to process, teletype messages to send, and transportation to arrange. 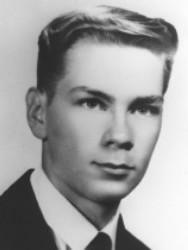 I learned that I was not the only American who died in Southeast Asia on October 16, 1970. There were eight of us�seven soldiers and one marine. I outrank all but one of them, but that is just a matter of record. Rank did not matter before, except when it was necessary to get a job done, and it certainly does not matter now. Moreover, to prove it, here we are in alphabetical order without our rank! From the Marine Corps, there was Ernest Daniel Cardwell of Concord, Virginia. From the Army there was Dominic John De Angelis of New York City; Wilfredo Galivan-Torres of Ponce, Puerto Rico; Stephen Edward Jesko of Hereford, Texas; John Dewey Livingston of Red Creek, New York; me of course; David Alan Moore of Lafayette, Indiana; Robert Thomas Wilson of Dothan, Alabama. The next day, October 19, 1970, they place my remains in a container, called a traffic case, and load it onto an Air Force C-141 transport plane that is bound for Kadena AFB in Okinawa. I am not alone, however. Two other traffic cases are loaded onto the plane. They contain the remains of Wilfredo and John. Wilfredo and I were Roman Catholic and John was a Methodist. All three of us were Infantrymen, and we shared the same casualty status: �hostile,� �ground,� and �gun, small arms fire.� Wilfredo and John both were 20 years old. 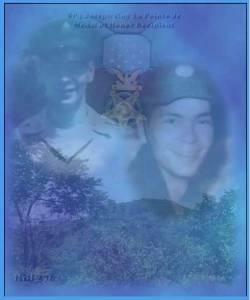 Both were killed in the Binh Thuy Province. Both received posthumous promotions. John, a draftee, arrived in Vietnam on March 19, 1970. 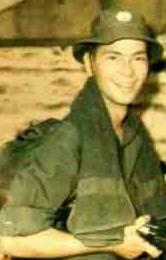 Wilfredo, an enlistee, arrived in Vietnam on August 31, 1970. My traffic case is labeled �NR 457,� which will mainly be of interest to the Chief of Support Services at Dover AFB, because my case contains all three of our fingerprint charts. The plane departs around 1:00pm and heads for Kadena. It arrives at 5:45pm, but this flight is bound for Oakland, not Dover, so we are off-loaded to a different C-141, which departs Kadena around 10:00pm. My remains arrive at Dover AFB at 9:00am on October 21, 1970. If the U.S. Army Mortuary at Saigon was big, the port of entry mortuary at Dover is huge. It is busier, too, but the staff here are just as professional and respectful. My remains are reprocessed for identification. They are cosmetized. The name of the gentleman doing the work is Howard W. Atwell. Howard, like James Hobgood back in Saigon, is a civilian. My remains are dressed in a U.S. Army officer�s uniform with appropriate rank insignia and decorations. They are placed in a metal casket. More paperwork is processed, and logistical plans are communicated to concerned parties. I have been so caught up in all of the attention being paid to me, that it has just occurred to me that I am going home. My family�my fianc�e�my friends...they are all waiting for me to arrive. Their lives have been shattered. I wish I could tell them that I love them, and that they should not worry about me, but I cannot." EXCUSE ME, DID YOU KNOW MY FATHER?